Hosting a showing of the rousing documentary, The Other Dream Team, yesterday reminded me of an important Springfield connection with our 1980s-90s Lithuanian Olympic basketball heroes. 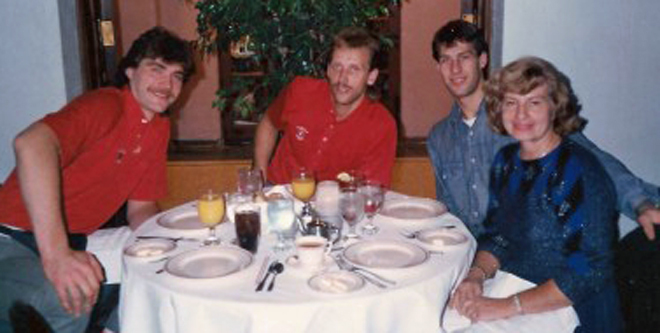 Ben and Vita Zemaitis of Chatham met Sarunas Marciulionis, Arvydas Sabonis (one of the greatest centers of all time), Rimas Kurtinaitis and Voldemaras Chomicius after a 1987 exhibition game at the PCCC. Back then, four Lithuanians formed the core of the USSR national team (Marciulionis was “Soviet Athlete of the Year”), even though what they really wanted was to play in the NBA, and of course, for their own country, Lithuania. Fall 1988, Lawrence, KS, fr. left – Rimas Kurtinaitis, Sarunas Marciulionis, Vita Zemaitis, Donnie Nelson. When Vita and Ben met the players in 1987, it was one year after Sabonis had been drafted, in absentia, by the Portland Trailblazers. Sabonis did not actually get to play for the Trailblazers for about another decade, after he was repeatedly and carelessly injured by the Soviet system. The players’ meeting with the Zemaitises in Springfield, which led to other introductions and meetings in other cities, also occurred one year before our Lithuanian superstars led the U.S.S.R. team to its famous 1988 Olympic gold medal victory over the United States. In “The Other Dream Team” movie, they explain that their victory was motivated by a Soviet quid pro quo promise that they would finally be permitted to play abroad. Lithuanian players in the movie describe being guarded by KGB agents whenever on tour. Yet they still managed to get away from their hotels and meet with Lithuanian-Americans who picked them up in parking garages and spirited them away in car trunks, returning them later the same way. Did Ben and Vita own a Cadillac that could fit one or more huge basketball players in its trunk? Did they have local Lithuanian-American accomplices? I was so involved, stateside, with the Lithuanian “Singing Revolution” (1987-91) that these young Lithuanian athlete-patriots who carried such strong hopes for their country’s re-birth became my greatest heroes. I only wish Vita could have lived to see such stirring history documented in “The Other Dream Team” film. But then again, she took part in it. The “Other Dream Team” is a great film! Thanks Sandy. It was really great opportunity to witness and be part of Lithuania’sbasketball history.